I got a little restless this weekend and rearranged our “multipurpose room”. You see, it’s getting a little noisy and chaotic to have all five of us around the table all the time, and this leads to cranky children who can’t get their work done. 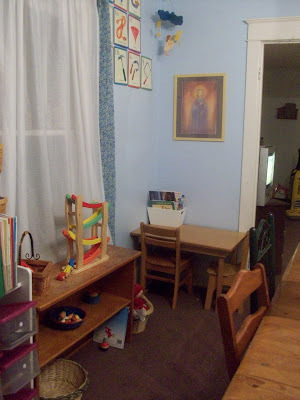 So I was left with the challenge– how, in a small house with four little ones, can we make this work? So I did what I could to give everyone their own space. I’d like to find somewhere else to put the trash can but, alas, we are fresh out of room. The gray box on the floor holds the stuff I’m saving for portfolios. 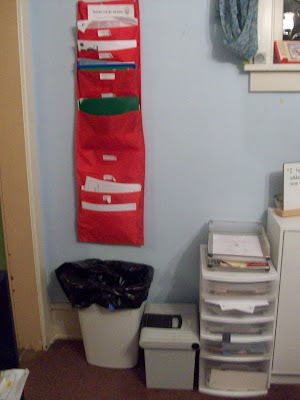 The red file thingie on the wall holds reading logs, spelling test papers, papers to file, and a folder with each child’s lesson planner and other papers for the week. 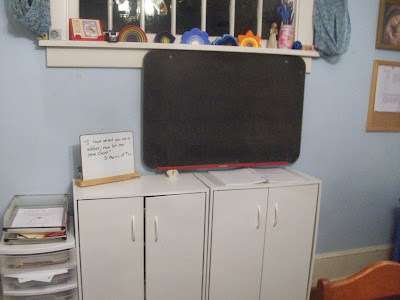 Next to that, we have the paper storage– from the top down it holds paper ruled for early elementary school, lined paper, graph paper, construction paper, and scrap paper. On top of that sits the finished work box. I took apart my big cabinet and made two little cabinets. I miss having a high place to stasg things though. 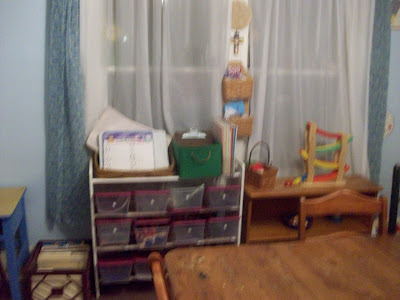 This is Michael’s corner, with his desk and his workbox. Eventually, I want to get something to set him box on so it’s not on the floor. It’s a little bare right now, but I’m sure Michael will make it his own in time. That is, if Daniel doesn’t get to it first! This is the part I’m most frustrated with. 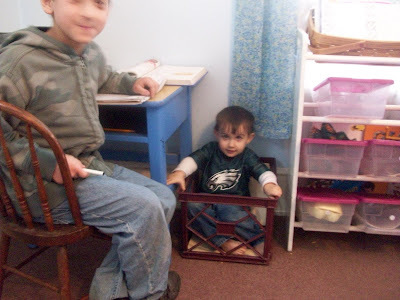 We have Nicholas’s workboxes and a shelf with toys. I really want to replace Nick’s shelf with… something else, I don’t know what… and move the toys shelf… somewhere else, I don’t know where. We have a small house and many children. Space is hard to find. 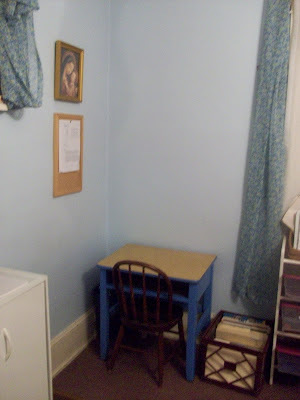 And here’s Nick’s little corner of the room! 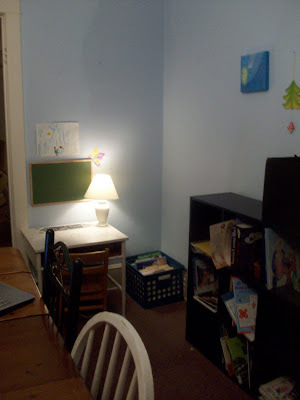 And Katie Grace’s space. Again, workbox on the floor. Must remedy this situation. And finally, our cubbies. 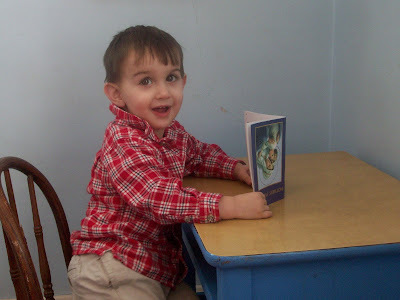 I need to get our nature table back up. I’m also trying to get rid of the “non-Waldorf” elements, for the most part, and move back towards where we started. Well, there you have it. It’s small and cluttered, but it’s ours. I think you have done a wonderful job arranging your space. 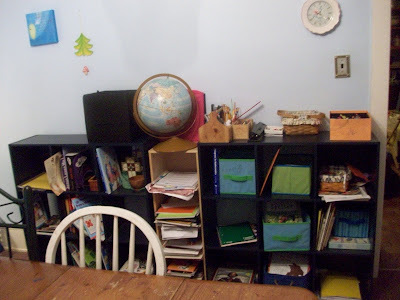 I have a pretty tight space for our schoolroom to and I keep drooling over the organization systems in Pottery Barn. Probably won't ever happen though:) Glad I found your blog! Thanks! I drool over those systems too. I love that they're real wood and that they're generally closed systems, so you shut the door and pretend the stuff doesn't exist anymore.